Zero Killed is a tactical multiplayer VR shooter that mixes tactical gameplay, engaging PvP multiplayer, a rich choice of equipment, and gadgets with a dash of sci-fi. All put into VR with unrestricted movement and an advanced collision system for full immersion. Negative (14) - 14% of the 14 user reviews for this game are positive. Cross platform voice chat! Finally! Progression system! Gain levels, unlock weapons, items and skins! Events to gather players in specific times. Bonus exp for playing during events! New, better way, to plant mines/ sonars etc. 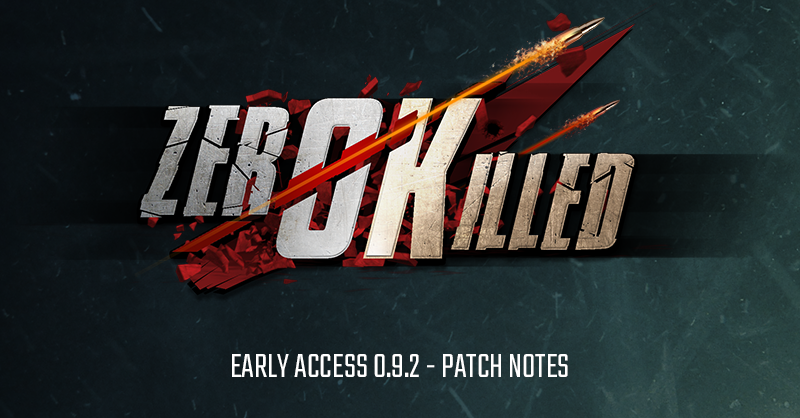 Patch 0.9.2 adds plenty of stuff and it's coming next week! Zone Zero. A region once flourishing and vibrant, now devastated and deserted. The day Perunium – a previously unknown, superconductive element ­– was discovered in the area, marked the fast and inevitable collapse of the entire territory. Once the governments and corporations were done extracting this new source of income, they evacuated all civilians and closed the region, declaring it neutral. Life abhors a vacuum, however, so it didn't take long for the first illegal miners to appear – and it took even less time for a quiet war between the main economic powers to start. Nothing was going on in the Zone according to the news – no bloodshed, and only a couple of random punks breaking the "keep away" order. Journalists belittled the whole thing reporting "zero killed". Case closed. Scavengers who remained in the Zone started calling themselves "Zeros": people whose lives are a dime a dozen, their deaths not even counted as casualties. A few years later, only professional Zeros remain in the Zone – people who have abandoned their past and broke any contact with former employers. You take the role of one of them. You are one of the Zeros. Just like real life special forces teams, Zero Killed focuses heavily on cooperation and communication. Both are key elements required to adapt and respond to the destructible environment. This means that being successful in combat will require planning ahead, foreseeing the opposite team's next move, tactical thinking, and accurately analyzing the situation on the battlefield before deciding who from your squad should do the next move or what piece of equipment to use. In Zero Killed you get to choose between 10 completely different characters. Each with their own loadout, a unique gadget, and a unique perk. All designed to make sure there's something setting them apart and make them special in their own way. Big Foot – a heavy weapons specialist and a former weightlifting champion. Equipped with heavy armor, a gas mask, and a door breacher, he comes as close as possible to impersonating a tank. Ghost – a mysterious man that excels in marksmanship. He doesn't share who he was before being assigned to the Zero Zone. His organization equipped him with lots of hi-tech equipment, such as the enhanced AR glass that allows him to track tagged objects for longer than usual. Samaritan – one of the best heart surgeons in her country, but officially died a month prior to her Zero Zone assignment. Sent to the Zero Zone as a part of a cleanup expedition, or at least that's what it was officially called. Pete – a young, hyperactive private assigned to the Zero Zone just after his Spec Ops training and constantly brags about his grades in the Air Force academy. Excellent in handling and shooting assault rifles. Constantly tries to hit on Hydra. A.N.D. – an introverted nerd with no social skills, but the intelligence of a genius. Offered an assignment in the Zero Zone as a way to avoid a life sentence for hacking the federal reserve and transferring the equivalent of a couple of trucks of gold to his off-shore account. OX – a former general that served in the Navy. After his son shot himself with his gun, he wanted a suicide assignment – he got the Zero Zone instead. Takes his anger out on the enemies. Brutally. Hydra – a highly disciplined lieutenant. Exiled from her country after organizing a coup against an 'unpatriotic' government and playing a vigilante by capturing and torturing deserters. Considers Pete childish. Price – a businessman, former owner of one of the organizations contracted with the extraction of Perunium in the Zero Zone. A computer science engineer with plenty of money. Freya – a defense specialist with Scandinavian origins. Equipped with heavy armor and an assault shield, she is the person that can definitely endure heavy fire. Paeon – a Persian doctor with a military background. Assigned to the Zero Zone as a part of the rescue teams, but officially hasn't returned. 4 Vs. 4 Multiplayer Gameplay. 10 completely different characters to choose from, all with unique gadgets, equipment, perks, and personalities. Traverse the world without teleporting including sprinting, climbing a ladder or sneaking around. Our motion sickness free technology will allow you to fully immerse yourself in the game world, without the risk of your enemy teleporting out of nowhere and attacking you from behind. Loads of equipment and gadgets that can be used to gain an advantage over the opposing team. Grenades, mines, sonar, explosives, hand cameras, and more! Real life interactions with the environment and objects. The enemy throws a grenade your way? Throw it back! Your team mate under heavy fire and out of ammo? Toss him your spare magazine. Do all you'd normally do on a regular battlefield. Realistic weapons behavior, including recoil, damage model, and obstacle penetration. Destructible environment. Doors blocking your way or your enemy using a wooden cover to hide? Smash them, blow them up, or crash through them. And don't forget to duck, cover, and keep moving to avoid getting hit. Just like you would in real life! Tagging system – crucial to victory on the battlefield. Remember that knowing your enemy's position gives you a big advantage and greatly increases your chance of victory.